The entire biblical text and the reading below are meant to be read aloud in the company of friends and fellow believers, followed by discussion, confession, and prayer. This is the Sunday’s Gospel Reading from John 20:19-31 (ESV) in the Revised Common Lectionary. There’s another great post on this text by our own Able Baker HERE, but the text has come up again as the reading in the 2018 lectionary — so, here’s another look. A few years ago, my wife and I, and several couples from our church attended a marriage retreat. For us, it was the first one we had ever been to. There were hundreds of couples there from all over, and each of them was in various stages of life, and at varying levels of marital health. It was interesting to learn that some couples were actually there who were separated, others were trying just one last thing before they signed the divorce papers, and at the other end of the spectrum, there were people who went every year because they never wanted to let their marriages fall apart. At the end of that first conference (we went back two other times), there was a vow renewal service. Many of the couples who had showed up broken and torn apart with tears of pain were leaving that event healed, hopeful, and with tears of joy. Each husband left with a “new” wife, and each wife left with a “new” husband — a new marriage was born! During my years in pastoral work I saw many people leave their spouses for new ones, but on this occasion, the new relationship and the new marriages were born out of the ones that were there before (hover over this — Rev. 21:5). Look again at how John continues the Jesus story here with the words, “On the evening of that day, the first day of the week.” Pause for a moment and think about it carefully. Doesn’t it sound more than a little bit like… “And evening and morning were the first day“? (Gen. 1:5b) I’m one of those people who believes that the Biblical authors are very intentional when choosing their words. There’s an important message to be heard here for those who have ears to hear. This is the beginning of the first day of the new world that God is creating for the new humanity of whom Jesus is the first (see Col. 1:18). It’s a new world because of what has happened to Jesus. Now, and forever, there is and always will be a resurrected human being living in God’s creation who would sit down at God’s right hand (Jn. 20:17). None of this was a reality before “that day.” But other things will happen as the new Genesis unfolds on this first day of the new creation that would spread beyond what God had accomplished in Jesus. Here, in John’s telling, other human beings are about to be included in the new creation project in very new ways. There is more that John wants to say about the new creation in Jesus. But first, look back at what happened with the first Adam. Here in John’s Gospel, a second Adam has been brought up out of the ground, but it is out of him that the breath of life flows out to the rest of humanity. In the first creation, God’s crowning work happens on day six when He creates humanity, But here, the new humanity is brought forth on the first day and shares not only God’s life-giving Spirit with others, but he also extends his own vocation as the new humanity to them. Jn. 20:21b — As the Father has sent me, even so I am sending you. This new humanity, re-born and brought into a new life in Jesus, and filled with the Holy Spirit, were sent out by Jesus to continue what was begun in Him. They would say and do things that he had said and done. They would be His ever-expanding, ever-reaching image, voice, hands, feet, and yes — his very presence — in the new world that God was making through Him. What God has done in Jesus… what God has in store for us! What God has done in Jesus’ resurrection is the best locus for understanding His future intentions for the rest of humanity, and all of creation (hover over this: Rom. 8:22-24). There wasn’t a completely different Jesus after the resurrection. 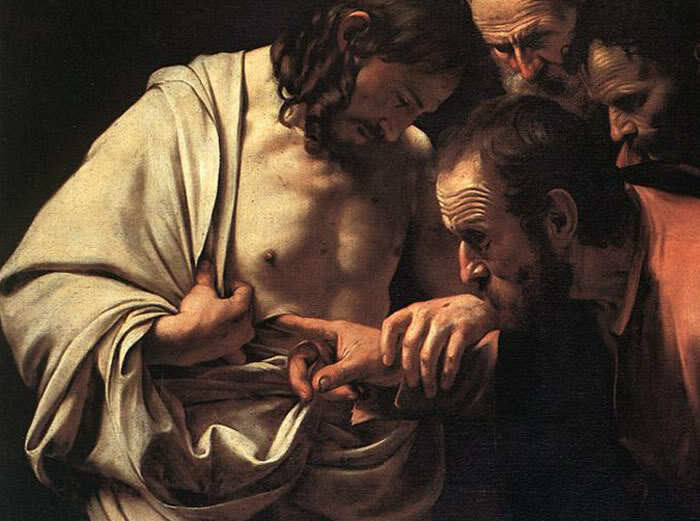 He told his disciples to touch his hands and his feet and his side, and to see that it was he himself (Jn. 20:27 and Lk. 24:39). There were things about Jesus that were gone, to be sure (think “death”), but the real Jesus was really there in His fulness. He was standing before them showing them what God had in store for every one of them! He was the New Creation, and if any person joins Jesus, that person joins the new creation with all of its present implications and future hopes. 2 Cor 5:17-19 — 17 Therefore, if anyone is in Christ, he is a new creation; old things have passed away; behold, all things have become new. 18 Now all things are of God, who has reconciled us to Himself through Jesus Christ, and has given us the ministry of reconciliation, 19 that is, that God was in Christ reconciling the world to Himself, not imputing their trespasses to them, and has committed to us the word of reconciliation. Jesus breathed new life into his disciples. He didn’t get rid of them for other better ones. Rather, he filled them with God’s Spirit, and sent them out to help people be rid of the things that keep us away from God (“the sins”). In this way, we are joining Jesus in the big thing that God is doing in the world. He is re-pairing, re-storing, re-connecting, re-moving, and re-constituting all things in Jesus. He will continue this work until every enemy of God is removed, and until all of creation is what God always wanted it to be. The resurrection of Jesus is just the beginning! 1 Cor. 15:20-28 — 20 But in fact Christ has been raised from the dead, the firstfruits of those who have fallen asleep. 21 For as by a man came death, by a man has come also the resurrection of the dead. 22 For as in Adam all die, so also in Christ shall all be made alive. 23 But each in his own order: Christ the firstfruits, then at his coming those who belong to Christ. 24 Then comes the end, when he delivers the kingdom to God the Father after destroying every rule and every authority and power. 25 For he must reign until he has put all his enemies under his feet. 26 The last enemy to be destroyed is death. 27 For “Godc has put all things in subjection under his feet.” But when it says, “all things are put in subjection,” it is plain that he is excepted who put all things in subjection under him. 28 When all things are subjected to him, then the Son himself will also be subjected to him who put all things in subjection under him, that God may be all in all. That world outside there is not waiting for a new definition of Christianity, it’s waiting for a new demonstration of Christianity.